Thank you all for always being there when my clients (and I) need you. I hope to do business with you all for many years to come. Thank you for the notes and I want to thank you too. My purchase on my new home will be closed very soon. This won’t happen without your professional help. It has been great experience working with you. Your team is always responding quickly to our requests, working hard to inform us about the various conditions of the houses, and also providing a lot of extra useful tips. I am very happy about your work. I believe your business will continue to grow! I shared your email coupon ($100 off) w/my buyers and let them choose between you..and 2 other fabulous inspectors i have used for years. In the spirit of never “steering” a client…i encourage them to call, interview..and then choose the one they most connect with. Well..they choose you..and Meri was phenomenal! My buyers were thrilled to have both their parents at the inspection..and they ALL asked Meri a ton of questions for 4 straight hours! =) She answered everyone..and they loved her! As a Broker..i was very impressed with her knowledge, professional attitude and just plain kindness! The report was delivered right away..and it was in a format that was easy to read, and use for our inspection response addendum. I look forward to working together..again, and again in the busy..abundant and blessed new year! Thanks for the note! We where so grateful to have such a good inspector!! Meri couldn’t have been better – she is extremely detail oriented, nice & trustworthy and I WILL be recommending her to friends and family! It is hard to find a good inspector, so we where so excited to find Meri through our realtor! Thanks again!! Just wanted to say how delightful it was to see George yesterday. I’m glad you are feeling fairly well. You look great! Also wanted to say that I really like your reports and how you do inspections. The summary is straight forward, in easy to understand language and is not frightening to the Buyer. You support everything in other documents with pictures, etc. Just wanted to say that I like the thorough job you do and with such style and class too. I was really unimpressed with Inspections Northwest a few weeks ago. My buyer in that case decided she wanted to use them as a friend had recommended their services. I also felt that she didn’t totally trust me thinking that some real estate brokers could select inspectors who will do a whitewash job. Anyway, as I described to George, I could not believe the hundred+ page report with visual sliding bars that were supposed to indicate the severity of the problem but in my mind just confused the issue. Your report and style is far better! Simplicity is good. Do hope you can continue to inspect homes. Love your service. Thank you. I wanted to thank you for going out of your way to accommodate my request for an inspector on the same day by 3pm. Larry was very professional and made my clients feel at ease. Since the home was built in 1955, we didn’t know what to expect. Most of his recommendations were minimal and my clients were very happy! Did I tell you we won the bid over eleven others; only because Rinehart provided us with an inspector! 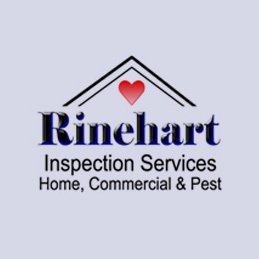 Rinehart Inspection Services came to our home within a days notice, and we were so happy with their prompt arrival and pleasant attitude. We were on our way to vacation the next day, and so we need to have our report right away. They were able to get me the report the same day, and we were able to leave knowing everything we need to about the things that needed to be fixed on the house. We have given our neighbors their number, and they are using them too. I’m a real estate agent and have used Rinehart Inspection Services for years. My clients are always satisfied with the way they explain things about the houses I have for sale, and I have been a client of their company for over 10 years. I have been using Rinehart Inspection Service for some years now and am very satisfied with not only the service but the communication and speed with which the inspection report is returned to me. George is very knowledgeable and has a good personal interaction with my clients making them feel comfortable that he is looking out for their best interests. The summary report is then delivered to me and to my client by the evening of the inspection. This is very important as many times we are running on a very tight schedule to reply to the seller. The report is laid out in a very professional and understandable format. The binder is very useful as is the attached notebook of “How To Maintain and Repair”. George Rinehart is always my first choice when recommending an inspector to my clients. George has worked for us, as an inspector, for 6 years. We think his dedication to excellence and thoroughness during and after the inspection puts him head and shoulders above the rest. George does not leave a stone unturned. Cheers & kudos to a great inspector. is taking place. I personally would recommend Rinehart Inspections to everyone. I was very pleased with the home inspection report from Rinehart Inspections. Mr. Rinehart was very thorough and caught a lot of things that I would not think or have the training to look for. His reports arrived promptly. Furthermore, he was able to come and inspect on short notice which enabled me to make an informed bid. It is a pleasure to offer this testimonial to George and his crew at Rinehart Inspectors. Not only do I suggest all my clients use George, I use him myself. I buy and sell distressed properties. Every time I find one, I call George. His inspection is like a blueprint. I simply have to go through the report, price the job and fix what’s important. George has never let me down. Even when I need the inspection YESTERDAY!!!. The Rinehart team are very much the realists. While they are thorough in their approach, they don’t scare the buyer. Rather, they take the buyer by the hand and point out what is important now and what can be addressed later. The Buyer inevitably leaves confident in whatever his decision may be. We all have had experiences with inspectors who think it’s all about them. George knows it’s all about the client. As a Realtor you can trust your client to the Rinehart team. I do. Thank you Vicki, It was a pleasure to work with Meri, I really enjoyed walking through the house with her. As a first-time home buyer, it was a great opportunity to learn about the home and what kind of maintenance is important. Meri was great at explaining how to properly fix and maintain the home. My wife and I have closed and are now in possession of the home and we are incredibly happy with it. Thanks so much!